OrthoONE at North Suburban Medical Center, a practice located in Thornton that provides comprehensive orthopedic services, welcomes new provider Dr. Darryl Auston. 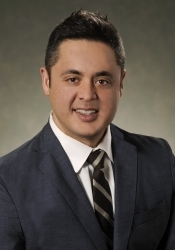 Dr. Auston is a board certified orthopedic surgeon that specializes in orthopedic trauma cases, including acute fracture care with a particular interest in pelvis, acetabulum (the socket of the ball-and-socket hip joint) and complex joint injuries. Dr. Auston is a board certified orthopedic surgeon that specializes in orthopedic trauma cases, including acute fracture care with a particular interest in pelvis, acetabulum (the socket of the ball-and-socket hip joint) and complex joint injuries. Before coming to OrthoONE, Dr. Auston served as the director of orthopedic trauma at Hughston Trauma in Orange Park, Florida. He earned his undergraduate degree in biochemistry and cell biology from the University of California San Diego and graduated from medical school at the University of Maryland School of Medicine. After completing his residency in orthopedic surgery at the State University of New York Upstate Medical University, he completed an orthopedic trauma fellowship at Florida Orthopaedic Institute in Tampa, Florida. Before working at Hughston Trauma, Dr. Auston served as an attending physician in the Department of Orthopedic Surgery at the Veteran’s Administration Medical Center in Syracuse, New York, while also serving as a clinical instructor of orthopaedic surgery at the State University of New York Upstate Medical University. At OrthoONE at North Suburban Medical Center, Dr. Auston will join Dr. Jared White and physician assistant Alyson Evans. Dr. White is a board-certified, sports medicine fellowship trained orthopedic surgeon who specializes in knee and shoulder surgery. Dr. White also sees patients once a week at Northwest ER, located at 11230 Benton Street in Westminster. For more information about OrthoONE at North Suburban Medical Center, please visit OrthoONEDenver.com or call 303-453-2997. As one of the largest orthopedic physician groups in Denver and Colorado, OrthoONE provides state-of- the-art orthopedic care to people of all ages and at all stages of life. With OrthoONE, you have access to dozens of highly qualified adult and pediatric orthopedic doctors at 14 locations around the Denver metro area, including Denver, Thornton, Englewood, Parker, Arvada, Littleton, Highlands Ranch and more. From fracture care to sports injuries, joint replacements to pediatric scoliosis or concussion care, our world-class team of orthopedic experts uses the latest technology and customized treatment plans to provide patients with the highest level of warm, personalized care. Visit orthonedenver.com or call 720-990-2570 to make an appointment or to learn more.